National Grid has said its first "gas deficit warning" for eight years will remain in place overnight. The power operator issued the warning earlier, saying it may not have enough gas to meet demand due to the current cold snap gripping the UK. Household supplies should not be affected, but the Grid is attempting to meet demand by limiting industrial use. 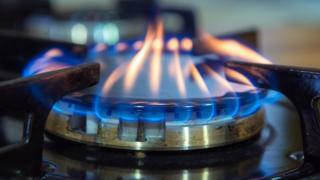 It said it had already seen an increase in gas supplies as the market responded to its warning that it needed more gas. But a spokeswoman for National Grid said it was "prudent" to keep its earlier warning in place. "We don't have a crystal ball", she added. The National Grid said it had not instructed industrial users to use less gas. "Any larger users of gas that have reduced their demand will have done so under commercial arrangements with their gas supplier," it said. Why is demand for gas outstripping supply? The biggest factor is the weather. The "beast from the east" is bringing sub-zero temperatures to the UK and with heavy snow, boosting demand for gas from both households and businesses. The cold weather has added to problems with pipelines from Norway, the Netherlands and Belgium. Energy analyst David Hunter of Schneider Electric said the industry no longer has access to the Rough gas storage facility in the North Sea that was closed by Centrica last year due to safety issues. These issues, along with declining supplies from North Sea fields, means the UK is now more reliant on gas imports. Demand is also higher due to the number of gas-fired power stations in the UK as coal-fired power stations are decommissioned. Can people still use their gas central heating and cookers? Yes. As energy analyst Peter Atherton says: "The last to get cut off is the domestic consumer." If suppliers are not able to meet demand, certain users will be asked to stop using gas, he explains. First gas-fired power stations will be asked to scale down gas use, followed by large industrial and business users. A Department for Business spokesperson said "domestic households should not notice any disruption to their supply". Will my gas bill rise? A short-term increase in on-the-day wholesale prices is not likely to feed into household bills, the spokesperson added. However, the cold snap has increased the number of requests for call-outs for engineers, British Gas said, which is having difficulty coping with the volume of customer queries. Two of the company's call centres in Scotland have closed due to staff shortages following the cold weather. Chemical company Ineos told the BBC it is likely to cut gas usage at its Runcorn plant by a fifth in response to the National Grid's request. However, the company said it did not expect the move to make a material difference as it gets most of the heat it needs from its own energy-from-waste plant. There was a large spike in trading prices for gas bought on the day on Wednesday, but prices for gas bought a month ahead declined slightly. Big energy suppliers mostly buy at least a month ahead so they can work out pricing for consumers and cut risks to their business. However, they also buy a day ahead, as do large energy users, and some smaller energy suppliers. Jeremy Nicholson, the director of lobbying organisation the Energy Intensive Users Group, said: "Industrial users typically buy gas linked to the day ahead price in the wholesale market, so the surge in gas prices is hitting them hard. "We are paying a heavy price to ensure gas continues to flow to the UK in these exceptional conditions."